Covenant Relationships: Cosmopolitan Parents, Should She Have Just Been Caned? Cosmopolitan Parents, Should She Have Just Been Caned? Olsen said Kaylee was not apologetic so in lieu of grounding her which she felt "Would not resonate” “I wanted Kaylee to truly experience the embarrassing feelings she had evoked in someone else by wearing clothes she felt self-conscious in,” says Olsen. “The goal wasn't to select clothes that were cheap; it was to buy things that Kaylee herself said she hated.” Also, Olsen told Kaylee that she wasn't going to force her to apologize to her classmate; her remorse had to be genuine. So she got her some very 1930s style embarrassing outfits (no, they can't be classified as vintage). Although Kaylee cried, the next day she headed to school wearing one of the outfits under a coat that she had zipped up to her neck. “When she came home that afternoon, Kaylee said the kids laughed at her for wearing ‘pajamas.’ She also felt so guilty that she pulled her classmate aside and apologized for her behavior the previous day." 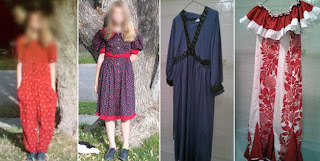 To solidify the punishment, Olsen snapped a photo of Kaylee wearing the outfit (her face was blurred to protect her identity) and posted it on Facebook. Someone said “She was trying to help this girl understand what she had done and teach her a life lesson. She knew what would make her child remorseful, and she employed it. I hear some of you asking "Why all that stress when she could give her 6 strokes of cain on her bottom and tell her not to do it again." Or " Try nonsense with my father, and you would sure have a nollywood movie tagged True Life Marks..". Yes, some Western countries frown at physical punishment but some parents still spank their kids. I personally know a lot of parents who still whack their kids in the UK. The cliche and ubiquitous rumor that it's only in Africa the kids are caned is so untrue. This lady realised that experience is the best teacher and I like the fact that she didn't compel her child to apologise. She realised that with the right punishment she would apologise of her own volition. Another fact that hit me was the fact that this woman was a STEP MUM. One would think she would step aside for the girl's biological father to mette punishment, and the possibility of the girl not listening to her step mum was also a realistic possibility. But obviously there has been some respect, discipline and boundary setting in place that caused her to take the punishment gracefully. School bullying is a national crisis, many kids have taken their lives because of it, for some it affects their grades and others join bad "gangs" to protect themselves from it. This is even worse now, as many of us join the diaspora. Kids must learn to respect all persons no matter how different the person dresses, speaks or anything else that makes them "different"
My personal opinion is that kids (the bullied) should be taught to have thick skin and self-esteem but that doesn't happen overnight. So perhaps the bullies should be given a taste of their own medicine. I admire the fact that with a little bit of effort and 'creativity' on the side of the parents, this former bully has been taught a life lesson.